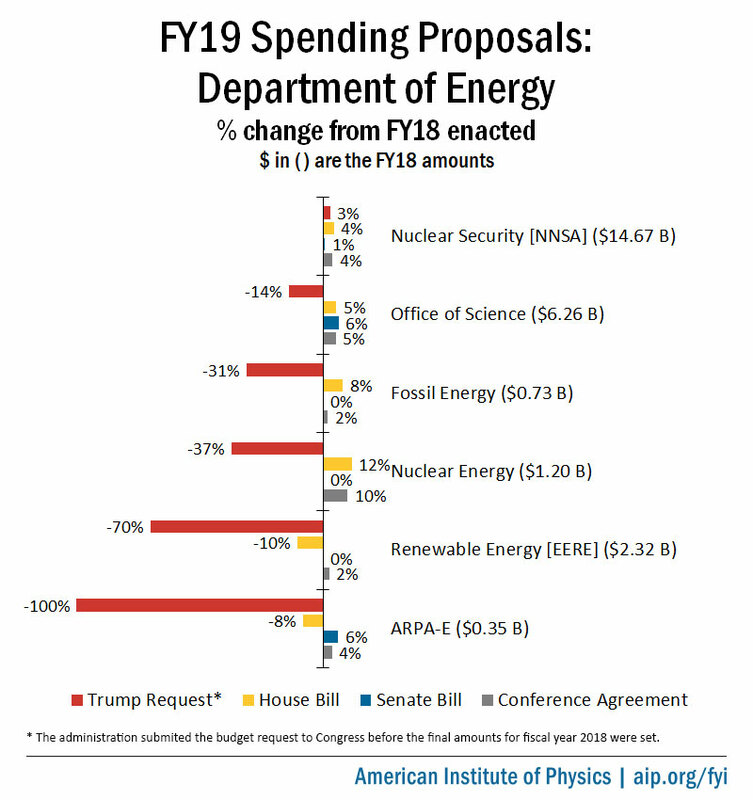 Congress has finalized a spending bill for fiscal year 2019 that would raise the Department of Energy Office of Science’s budget by 5 percent and the department’s applied research offices’ budgets by between 2 and 10 percent. If enacted quickly, as expected, the legislation will provide DOE with on-time funding for the first time in two decades. Yesterday, Congress finalized its fiscal year 2019 appropriations legislation for the Department of Energy, providing funding increases across most of the department’s R&D programs. Packaged with two other spending bills, the agreement arrives almost three weeks before the end of fiscal year 2018 on Sept. 30. The Senate and House plan to vote on the package in the coming days. Assuming President Trump signs the legislation, it will be the first time in nearly 20 years that DOE has received a timely appropriation. The finalized budget levels for DOE’s various programs offer few surprises, coming in close to those originally proposed by the House and Senate. They largely disregard the Trump administration’s proposed cuts to many of the department’s research activities. The final bill is posted here and the accompanying explanatory report with program-level policy and funding direction is available here. Details for selected programs are also available in FYI’s Federal Science Budget Tracker. Congress’s ability to deliver timely appropriations this year owes mainly to a deal reached in February to raise caps on government spending in fiscal years 2018 and 2019. Having overarching spending levels in place — and additional resources to satisfy competing priorities — removed many of the hurdles that often impede the appropriations process. Moreover, leaders in both parties have made a sustained effort this year to proceed quickly and avoid partisan confrontations over spending. If the legislation is enacted before the month’s end, DOE will be protected from any government shutdown that would occur should a stopgap spending deal prove elusive. The department will also be able to begin new projects and, with knowledge of how much funding will be available, it will be freer to distribute grants and enter contracts. A few other science-supporting agencies could also receive their appropriations soon, but many will likely have to wait until after the November election. Notably, neither chamber has yet passed its spending bill that funds NASA, the National Science Foundation, the National Oceanic and Atmospheric Administration, and National Institute of Standards and Technology. 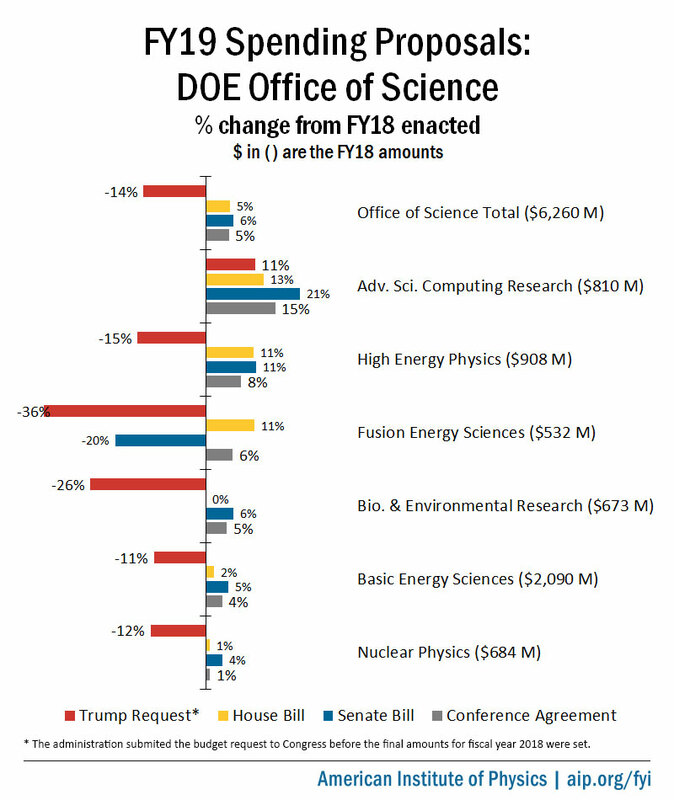 The budget for the DOE Office of Science will continue along the upward trajectory it has followed in recent years, rising 5 percent over its current level to almost $6.6 billion. The new level is slightly below the House and Senate’s proposed increases but far higher than the $5.4 billion the administration requested. Advanced Scientific Computing Research. With the administration and Congress aligned on the importance of exascale computing, the ASCR program continues to grow rapidly, with its budget rising $126 million, or 15 percent, to $936 million. The budgets for the Leadership Computing Facilities at Oak Ridge and Argonne National Laboratories will each have nearly doubled over the past two years. Basic Energy Sciences. With the BES budget increasing $76 milion, or 4 percent, to almost $2.2 billion, light and neutron source user facility upgrades are set to proceed smoothly. Funding will now ramp up significantly for the Advanced Light Source Upgrade at Lawrence Berkeley National Laboratory and the Proton Power Upgrade at Oak Ridge’s Spallation Neutron Source (SNS). The agreement also specifies $6 million for preliminary work on the SNS Second Target Station, marking the first time Congress has directed funding to the long-awaited project. High Energy Physics. With a budget of nearly $1 billion, 8 percent above the current level, there will be robust funding for HEP program's major facilities and equipment projects, including a $105 million contribution to the high-luminosity upgrades at CERN’s Large Hadron Collider. The $130 million budget provided for the flagship LBNF/DUNE neutrino experiment is not quite so much as either the House or Senate had initially proposed, but with 40 percent more funding than last year, construction will continue to ramp up swiftly. Fusion Energy Sciences. The FES budget will rise 6 percent to $564 million, with $132 million specified for the France-based ITER project. That is the largest DOE contribution to the project since fiscal year 2015, though it is significantly less than what House proponents had pushed for to meet the U.S.’ full obligation. Nuclear Physics. Funding for NP will increase $6 million, or 1 percent, to $690 million, but the ramp-down of construction on the Facility for Rare Isotope Beams at Michigan State University will free up an additional $22 million in the program’s budget. Biological and Environmental Research. The BER budget is increasing $32 million, or 5 percent, to $705 million, with $17.5 million specified for replacing the Atmospheric Radiation Measurement user facility’s Gulfstream airplane. No funding is specified for BER to restart its low dose radiation research program, but Congress is likely to require it to do so through the bipartisan “DOE Research and Innovation Act,” which is scheduled for a final vote this week. Congress continues to rebuff the Trump administration's proposals for deep cuts across DOE's applied R&D programs. Rejecting the administration’s policy of focusing mainly on “early stage” research, the report directs DOE to "maintain a diverse portfolio of early-, mid-, and late-stage research, development, and market transformation activities." Advanced Research Projects Agency–Energy. Turning back the administration’s second attempt to terminate ARPA–E, Congress is boosting its budget by 4 percent, bringing it to a new record level of $366 million. Nuclear Energy. The NE budget continues to rapidly rise, increasing $121 million, or 10 percent, to over $1.3 billion. Over half of the increase is specified for nuclear R&D, where the reactor concepts program budget is rising by 36 percent to $323 million. The report also specifies $100 million for an effort focused on advanced small modular reactors and $65 million to ramp up work on a versatile fast test reactor. Fossil Energy. The budget for FE is increasing $13 million, or 2 percent, to $740 million, with funding for carbon capture and carbon storage programs remaining steady at $101 million and $98 million, respectively. Electricity delivery and cybersecurity. The report abides by the administration’s proposal to divide the Office of Electricity Delivery and Energy Reliability (OE) into an Office of Electricity Delivery and an Office of Cybersecurity, Energy Security, and Emergency Response. Combined funding for the new offices is $276 million, or $28 million above the level OE received last year. NNSA’s budget will rise by 4 percent to $15.2 billion, continuing a multi-year spending ramp up to finance a comprehensive modernization of the U.S. nuclear arsenal and its associated weapons production complex. The increase primarily goes toward programs dedicated to maintaining nuclear warheads and building nuclear reactors for submarines. Weapons RDT&E. The budget for weapons research, development, test, and evaluation activities remains about flat at just over $2 billion. Within this amount, NNSA’s contribution to DOE’s exascale computing initiative is funded at the requested level of $163 million and the Science program sees a slight increase to $480 million. The Inertial Confinement Fusion program is also kept level at $545 million, rejecting the administration’s requested 20 percent cut. The report specifies level funding for the National Ignition Facility at Lawrence Livermore National Laboratory, a 7 percent increase for the OMEGA Laser Facility at the University of Rochester, and a 13 percent cut for the Naval Research Laboratory’s ICF program. The administration has proposed to withdraw from the OMEGA Laser Facility over a three-year period and zero out funding for the Nike Laser at the Naval Research Laboratory. Low-yield warhead. Among the other contentious issues in this year’s budget cycle for NNSA was the Trump administration’s proposal to begin developing a submarine-launched low-yield nuclear missile. The final agreement includes the requested $65 million. Some Democrats objected to the idea on the grounds that new low-yield weapons would lower the threshold to initiating nuclear war, while the administration maintained that such weapons would enhance deterrence. Included in the three-bill spending package alongside the DOE bill is the one that funds the Legislative Branch of the federal government. The explanatory statement for that bill directs the Government Accountability Office, which is in the Legislative Branch, to develop a plan to replace its existing Center for Science, Technology, and Engineering with a “new more prominent office.” The statement also directs the Congressional Research Service to examine existing advisory resources available to Congress, including GAO, and to assess the need for a separate entity dedicated exclusively to science and technology policy.